A brand new first-of-its-kind industry cloud benchmark is coming soon! The new SPEC Cloud benchmark was developed by SPEC, one of the primary industry standard benchmarking consortiums, to measure performance and scalability for private, public, or hybrid Infrastructure-as-a-Service (IaaS) cloud. 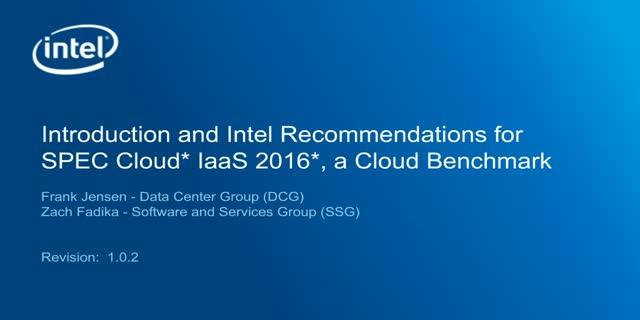 Customers will likely use the benchmark results to compare offerings from cloud providers, so Intel recommends you download and run SPEC Cloud on your infrastructure. Want to learn more? Business leaders as well as technical benchmarking leads will gain valuable insights in this 60-minute webinar. We will provide an overview of SPEC Cloud, benefits of using the benchmark, how to gain access, and technical details including workloads and metrics. We will also share a sample report. Please forward to your peers and ensure your organization is ready to take advantage of this new benchmark! Questions? Email us at intelcloudtechnology@intel.com.